There are many women we want to recognise on a day like today, International Women's Day. For those in this space, there is a standout. One of Italy's first female doctors, a revolutionary, Maria Montessori. Maria Montessori we thank you for providing light and hope for children and women in the past, present and future. For those who are interested here is a Timeline of Maria Montessori's Life and Biography. This page has lots of good information too. I also want to pay tribute to other strong women educators, leaders and role models in our community including Montessori teachers. I want to recognise the Montessori teachers that teach me, Meghan and Simone. Thank you for the work that you do! Montessori Rolling Toys that Promote Movement - Learning to Crawl. "One of the most thrilling achievements for a child is learning to move himself through space to get to a desired object. Infants have many different ways of doing this—backwards, tummy on the ground, sideways, creeping, crawling, rolling, lifting tummy alternately with arms and legs. This is important work! Sometimes a child grunts or yells as he works, or falls asleep for a few seconds between “push-ups.” The child enjoys the process of experimenting and learning as much as he enjoys the final success of being able to crawl. We can help the child in this valuable work by not interrupting him as he works and by offering balls and toys that roll at a slow pace, are interesting to look at, touch, feel and listen to. If the toy moves too far too quickly the child will give up, and if it does not move at all there will be no challenge." - Montessori Philosophy and Practice, The First Year - Crawling, Pulling Up Standing, 2009-2010 edition of The Joyful Child, Montessori from Birth to Three. At five months, Otto has lots of different ways of getting around. His favorite is the roll and pivot, he can use it to get almost anywhere fast and he can get across an entire room. Lately, he has been getting up on all fours and rocking, rocking and then launching himself forwards. Previously he would creep forwards slowly until he would run into something like his mirror or shelves. From birth, we recommend the child has lots of free time in a movement area or on a movement mat. I also recommend lots of time with the child's legs and feet free from clothing. If you haven't already, now is the time to ensure the child has access to interesting toys and materials that promote movement. What toys promote movement? Toys that can move, but not too fast. We use lots of play-mats in our home, or rugs or carpet surfaces, most balls will not roll far. If you have hard floors some balls will roll away too far and too fast for the child. Some cylinder rattles and the interlocking discs are perfect as they will often move just out of reach of the child - providing an incentive for movement! Many of these are also toys that we use to promote hand to hand transfer, so they have multiple benefits! The balls and cylinders with bells also provide a nice auditory stimulus. Otto loves to put things into his mouth and often gets frustrated when they won't fit, so the Skwish, Interlocking Discs, Teething Ball, and Small Bell Rattle are extra satisfying to reach. This stage in development is incredible to watch! How we clean and store our Montessori materials at home. How do you clean and store your Montessori materials? Every month it's worth deep cleaning your materials and play spaces to keep them safe and in good working order. This includes running a damp cloth over dusty shelves and drawers. Here are a few other materials that could do with a clean! Schleich and similar model animals. You can involve your child in the process, however, a deep clean by an adult is a good idea every month depending if you've had any illnesses or if they have been used in the bath (watch for mould and soap scum), outside or in the sandpit. We soak our model animals in warm soapy water for a couple of hours, to loosen the dirt, and then clean with a soft bristled brush. We rinse and air or towel dry. We store our animals in small plastic tubs. We have a few separate tubs including a tub for dinosaurs, sea/ocean animals, farm animals and for miscellaneous animals. Wooden baby toys. We wipe these down with a damp clean cloth and air dry. They are stored wrapped in brown tissue paper in small plastic tubs. We use a beeswax polish to maintain them. We also use the beeswax polish on other wooden toys such as our wooden barn. The barn gets dusty easily and needs a good wipe out every couple of weeks. Our playgym gets wiped down every week. Montessori mobiles. Our mobiles usually only need a wipe down with a clean and dry cloth. We store our tactile mobiles in the box they came in. Our visual mobiles, we currently use the dancers, butterflies, hot air balloon, and whales, are stored in A4 plastic pockets. Child's table and chairs. I absolutely recommend having your children help with this but every month we give the chairs and tables a once over. A soapy cloth will remove most build up followed up with a hand dry with a soft cloth. For our art table, I give it a deep clean once every six months and if necessary I will also sand it back and then repolish with beeswax to remove paint and protect it for another six months. Kitchen and gardening tools. It's a good idea to teach children how to maintain these. We generally store the children's gardening tools with the adult's gardening tools and give them a wash down with the hose every weekend. They will need to dry completely before storing to avoid rust. Kitchen tools are mostly stored in the children's shelves or drawers in the kitchen and most often they go through the dishwasher after being used. Our children's brooms need a shake outside every other day. Dustpans can be wiped down with a damp cloth. Aprons laundered weekly, or more/less often depending on use. It is worth considering sanitising children's mops with hot water weekly and air dry after every use. 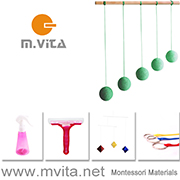 Miscellaneous Montessori toys and materials. I try to store toys like puzzles, imbucare boxes, coin boxes, and stacking materials in their original boxes. This helps to protect them and makes them easy to stack. A dust with a damp cloth is all they need, make sure they are completely dry before storing. Laminated cards and materials. If you are anything like me you have a lot of these. Before our cards are put away we wipe them down with a damp cloth and leave them to air dry on a clean cloth. This is so important for toddler cards, sticky toddler hands can leave fingerprints or food marks which can ruin the cards. The cards also need to be completely dry so they don't deteriorate or get moldy in storage. Some companies sell their cards in labeled, durable thick plastic pockets which are ideal. I store my handmade cards in fabric pouches or drawstring bags or ziplock bags if I can't find an alternative. Clean and labeled envelopes would work well too. I will often store packets of cards in glasslock containers either by topic or age group. For example, some containers will have lifecycles in them, while others will have toddler matching cards. In our home, we try to reduce, reuse and recycle as much as possible. We keep as many original boxes and packets as we can and we keep all small fabric pouches and drawstring bags as they are fantastic for keeping materials together. Now with three children, I really appreciate clean, well packed and stored Montessori materials! Weekend Reading - Montessori Links and Things. How was your week? Ours was nothing short of amazing. We experienced a lot of snow, there was so much snow overnight the boys had to stay home from school today. We have a really child-friendly neighborhood and the children were able to play in the street all day (yay for free ranging kids!). Here are a few Montessori related articles that I've been enjoying this week. This has me thinking - Why We Use Only Natural Crayons (and You Should, too!) at Rainy Day Sunny Play. I love this gadget so much I ordered one straight away, the Grape (or cherry tomato) Slicer, perfect for toddlers, found via Angela Momtessori! This might be the-most-gorgeous Montessori kitchen I have ever seen, at Play Art Learn. This is the best - Simon making French Toast at Midwest Montessori. Simon is two! A Carpentry Area at Où es-tu, COQUELIPOP. A sweet weather station at Emil und Mathilda. 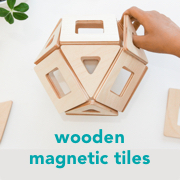 This is a sweet tray - Ten Minute Montessori: Exploring Magnets at My Little Keepers. Above is a picture of Otis' desk and his latest copy of National Geographic Kids, which is a favourite. I hope you have a lovely weekend! How to add warmth to your Montessori environment! Montessori environments including classrooms are known for being warm and home-like. But what if you have moved house or set up a new environment that has you feeling a little cold? Here are a few of the ways I've intentionally 'warmed up' some of our Montessori home environments. Most of these are super easy and quick to do. Add life, add a plant. Air plants, seedlings, propagate some plants, full grown indoor plants will instantly add warmth to your area. Plants can work really well in an infant area but be selective in toddler areas. I recently put a plant on Otto's infant shelves (he's not at the crawling stage yet) and wow, it made a big difference, it's now a space I want to spend time in. Add flowers, a small bud vase. Sometimes it's the little things. Even a few green leaves or some herbs from the garden in a glass jar can warm up an area, or try growing some plants in water! If plants or vases aren't going to work in your area due to safety, I'm thinking a toddler bedroom where you want it 100% child safe, how about putting them on a high window ledge or have a hanging plant, I'd love a hanging macrame planter! Add texture and textiles. Floor rugs, wall hangings, cushions. Oversized cushions work well in reading areas. In Otis' reading corner we used some large cushions (he picked them out) and Otto's bedroom instantly feels warmer with a large wool floor rug. Look for woven and baskets of natural materials. Book baskets, baskets holding napkins or pencils, look for a way to replace any plastic or unsightly receptacles with natural baskets. Soft lighting. This can be difficult in an infant or toddler rooms but it worked really well in my older boys' rooms, both now have desk lamps which we put on in the evenings and it instantly makes their rooms feel cozier and gets them ready for bed. I've seen lamps used really well in Montessori children's houses to mark the end of the day. I've seen lots of Reggio environments use fairy lights (much like we did with Caspar's room here) to add a bit of warmth and sparkle. Nature prints, watercolors paintings or child made art. Have a child, sibling or cousin make some small art pieces to put on the wall, even small pieces of art can make a difference. Waldorf stars on the window always look warm and inviting, they are simple and quick to make. Always use timber picture frames. We have used white frames before but really love the warmth provided by light honey toned timber frames, again it makes a big difference. Use Beeswax candles. Candles can help to warm up snack time or meals. A lovely friend suggested using some candles at breakfast when we first arrived to the UK and were really feeling the darkness in the mornings. Pets. A small fish tank and hermit crabs have really helped some of our environments feel alive! Pets can last a lifetime though, so obviously choose for the right reasons. A nature display. As pets aren't an option for us right now a small nature display works perfectly. Otis has a small tray in his room of some of his new nature finds and some viewing lenses (a magnifying glass would work too), it's little more than a few leaves, pine cones, interesting sticks and some rocks but it brings some of the outside, inside. Mix old and new materials. Use some secondhand or perhaps vintage materials or furnishings, rugs or baskets. Throughout our new home we've used vintage, worn or handmade planters to help create a personal, warm feel. Go for handmade whenever possible. For classrooms, this can be as simple as asking parents to make napkins or aprons. I can only sew simple things but love making tablecloths using unique prints. For things like children's napkins or aprons, I will often use Etsy. I love to use ceramic handmade vessels to hold odds and ends or handmade mini bowls in activity trays. Use essential oils. Child-friendly essential oils can be both warming and calming, they can be found or included in a few products such as soaps, playdough or room spray. Even some dried lavender in a bowl can help make a space feel cozier. Above Otto's room is now feeling warmer and cozier! Some baskets, a plant and, a wool rug has made all the difference.